If you ever meet a Navy veteran, ask them to tell you a story about their favorite Chief. You will learn how a Chief has influenced them to become the person they are today. When I reflect on my time in the service there is one Chief that I will always remember. He got to work before us, left work after us and maintained the aircraft right by our side. He was never too good to perform any job, no matter how dirty. He called us out on our nonsense, inspired us to be our best, and set the standard high for our team. Navy Chiefs, often known as the “backbone of the Navy,” are the front-line leaders for the entire enlisted ranks, They bridge the leadership gap between the ranks of enlisted and officer. A Sailor becomes a Chief Petty Officer when they reach the top three senior enlisted ranks. At this point in their career, they have accomplished a proven track record of being a distinguished leader. Sailors endure six weeks of intense training and have a proven track record of leadership to earn the right to be called a Chief. After the training and a ceremony, they join the 125-year-old “Chief’s Mess.” The Chief’s Mess is a unique group of senior enlisted leaders only in the Navy; no other military branch has a senior leadership group similar to the Chief’s Mess. Chiefs hold the responsibility of not only seamlessly conducting operations but strengthening the performance and character of the Sailors on their teams. Due to their length in service and extensive experience in the Navy, Chiefs lead and mentor junior enlisted sailors and officers alike. The Chief’s Mess has a lot to teach their fellow service members and the corporate world, with their drive to pursue the theoretical limits of performance and outstanding leadership ability. The following three lessons are applicable to any business small or large and integrate concepts that can benefit an organization’s ability to make decisions, share insight, improve training, and encourage high levels of responsibility. Even with their extensive experience, there are times when a Chief won’t have an answer to a tough situation. When the Chief doesn’t have an answer, he or she brings it to the mess. “If you don’t have the answer, it’s in the Mess,” is a common saying in the Chief’s Mess. The Chief’s Mess leverages the combination of experience with all the senior leaders. The Chief’s Mess is where the toughest answers can be found with hundreds of years of combined experience. As a result, the Chief’s Mess is a highly efficient cross-functional team that spans commands, ships, and the globe. 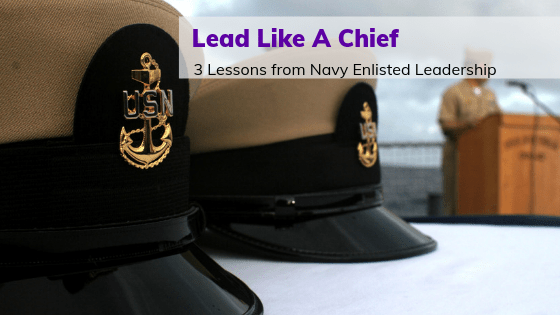 As a leader, what can you learn from the Chief’s Mess? Learn to leverage the knowledge of your fellow senior leaders. A common problem in the corporate world is that managers “manage” in silos. Leaders often create cut-throat competition and gun for higher positions within the company. With this type of competition, Leaders do not openly share all the information, wisdom and input with other senior leaders. Yet, in the Chief’s Mess, the top three ranks are united and share their unique knowledge with each other to further their mission. The Chief’s Mess knows that openly sharing information furthers the mission of the Navy as a whole. Not all Chiefs in the Mess have the same job; they leverage each other’s knowledge to their fullest potential. Leaders can encourage their organizations to come up with unique strategies to solve issues through holding confidential mid-level management roundtable sessions. One of the main duties of a Chief is to train their reliefs. Chiefs train their Sailors to push the limits of their own performance, because at some point every Chief will retire. It is the Chiefs who help develop their young sailor’s character, skills, and competence to successfully accomplish missions around the globe. Chiefs mentor, guide and train junior sailors in every aspect required to ensure that those sailors are performing at the top of their game. The concept behind training your replacement goes beyond formal training, and blends into day-to-day interactions. Every conversation is training focused to ensure the development of young sailors. Leaders can take this lesson in training from the Navy Chiefs. Be dedicated to the growth of their younger employees, and you can provide an invaluable service for the sustainability of your company. A day-to-day culture that is focused on training ensures the employees can perform their duties with the highest amount of knowledge, skills and resources, which in turn, gives back to the company. If you’ve been a leader long enough, you’ve heard someone say, “that’s not in my job description.” This common perception destroys team engagement and shows a lack of responsibility and dedication to teams. Alternately, Chiefs exemplify the standard Radical Responsibility. With Radical Responsibility every individual owns not only every decision they make and every action they take, but they accept responsibility for the success of everyone around them, now and forever. Having a level of responsibility that is beyond printed words can sound like nonsense. Yet, this level of responsibility, a level so radical, they don’t even print it, is the foundation of Chief Leadership. Radical Responsibility, like what is exemplified in the Chief’s Mess, creates a standard of excellence, and sets the bar for the entire ranks of the US Navy, both enlisted and officer. When a Sailor joins the Navy, he or she takes responsibility for taking a Stand for the Navy, for promises made prior to their service, and promises to be made after they leave. Chiefs encourage their Sailors to not only take responsibility for their own decisions, but to take responsibility for the actions of everyone on their team, their department, and their command. Radical responsibility is the umbrella for accepting responsibility that goes far beyond your job description. Radical Responsibility is about honoring our promises on behalf of ourselves, our team, and the company we pledge our lives to. As a leader, leveraging the knowledge of other senior leaders, having training-focused conversations and accepting Radical Responsibility will raise your ability to lead with impact, and truly model and inspire those around you.